When I think of the music to have come from Liverpool over the years, it boils down to The Beatles, Echo & The Bunnymen, some bloated britpop and The Coral. 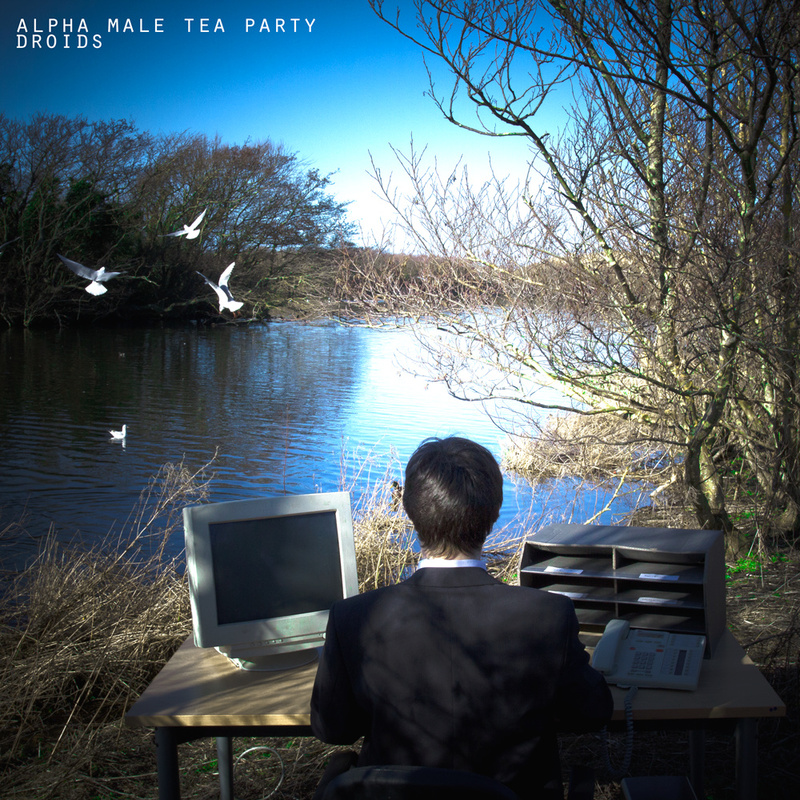 With their offbeat song titles and constantly changing time signatures, Alpha Male Tea Party offer up something you’d probably find on outer space rather than the city of Liverpool. Instrumental guitar based music usually evokes guys going balls out on a guitar solo on either scalloped fretboards or 3 necked guitars, with egos the same length as their hair (Yngwie and Vai, I’m looking at you) Alpha Male Tea Party have virtuosity, but it isn’t just mindless shredding and there isn’t that underlying huge ego either. ‘Happy As Larry, Larry Is Dead’ flips seamlessly from math rock riffs to bone crunching heavy metal riffs. Just when you think a song is going in one direction, the band throw another riff in your face, in an almost regimented, mechanical way, so it might be fitting in some cases that this album is called Droids. But that does not mean that songs on the album can’t be emotional, towards the back-end of ‘Judas The Tenderiser’ the song builds into a driving, rousing outro. Similarly, the main riff of ‘Athletes Face’ is uplifting. For the outro, Alpha Male Tea Party play their cards close, giving us serene chords and synths, then unleashing into discords that hit harder than a Stone Cold Stunner. ‘Your Happiness Was Stored On A Hard Drive And Is Now Corrupt’ is like the slow part of a rollercoaster, offering a you a chance to gather your thoughts before the you get hit with the speed and intensity again. Calm and peaceful, it is one of those tracks you put on repeat for want of it being longer. With Droids Alpha Male Tea Party have combined lightning quick, bone crunching riffs, exhilarating outro’s and atmospheric chords. After each listen there is another layer to discover, proving that instrumental rock doesn’t have to be one big ego trip. Alpha Male Tea Party Bandcamp. Soundcloud. Facebook. Twitter. Posted in reviewsTagged Alpha Male Tea Party, Droids, LiverpoolBookmark the permalink.